On the afternoon of Sunday, March 29, Terry Pinckney was pulled over for speeding in Hephzibah, GA where he is a teacher at Glenn Hills Middle School. According to news reports, upon pulling Pinckney over on Hwy 25 near Wilson Rd., the officer noticed a strong odor of marijuana. The officer who arrested Pinckney claims that the teacher kept repeating that he was a teacher, and begged him not to get the K9 to search his vehicle. Upon searching Pinckney’s vehicle, officers discovered 8 marijuana joints which were partially smoked, and four bags of marijuana that in total weighed 30.6 grams. The teacher was arrested and charged with felony possession of marijuana. While some states have legalized marijuana for recreational use, most have not. It is still a crime in most states to possess marijuana, a crime that can leave individuals facing serious and life-changing criminal penalties. In this case, the defendant’s career and reputation may be ruined in addition to whatever legal consequences he may face. In the state of Michigan, possession of any amount of marijuana is considered a misdemeanor; a conviction may result in up to $2,000 in fines and a maximum of one year in jail. 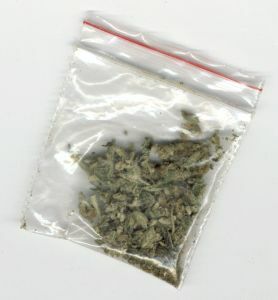 However, when an individual is found to be in possession of an amount of marijuana that would seem more than necessary for personal use, prosecutors may attempt to charge that person with possession with intent to distribute/deliver. In this case, the criminal penalties would be far more severe, depending on the amount of marijuana involved and other factors. If you have been arrested for marijuana possession or any crime involving illicit or narcotic drugs or substances, consult with a skilled and aggressive Michigan drug crime attorney immediately. Without legal support and guidance, your freedom, future, and career may be at risk. Depending on your situation, it may be possible to have charges dismissed, or to seek out legal options that would be less damaging. Should you go to trial, it is important to have a capable lawyer who will work vigorously to prevent a conviction.